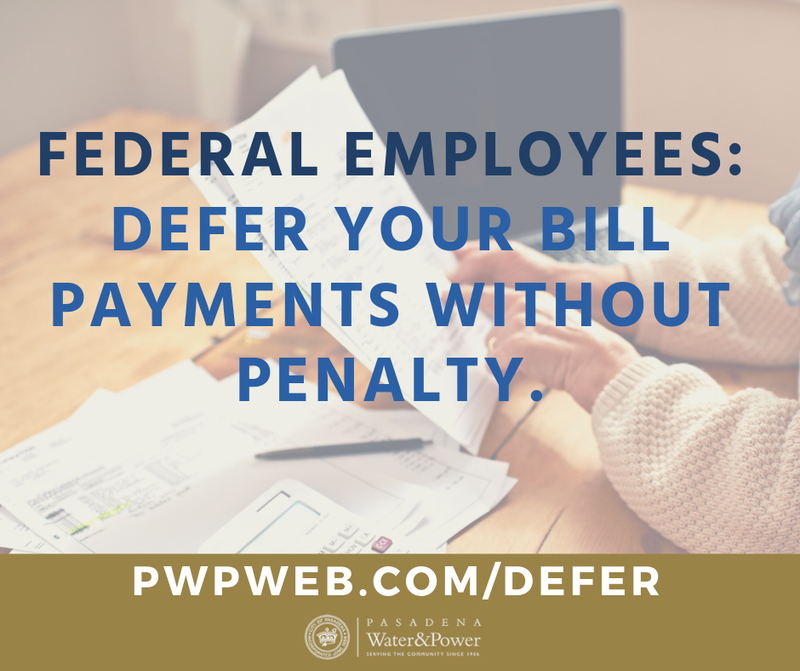 PASADENA, Calif.— Pasadena Water and Power (PWP) will offer residential customers who are federal employees the option to defer utility bill payments without penalty until March 1, 2019, or until the federal government resumes full operations. The utility will postpone collection activity and late fees for affected federal employees upon request. The partial government shutdown, which began on December 22, 2018, has affected approximately 800,000 federal workers throughout the country. “The benefit of being a locally-owned utility is that it allows us to focus on our customers. PWP recognizes that we have Pasadena residents who are federal employees and may be financially impacted by the government shutdown. We hope to offer a bit of relief in order to ensure necessities like electric and water service are not disrupted during this time,” said PWP General Manager Gurcharan Bawa. To receive bill deferral assistance, customers must verify their identity and account information by sending a request to PWP by email, mail or by calling customer service. Once the federal government shutdown has ended, PWP will contact these employees to establish payment terms. Additional information about the temporary assistance offer will be featured on the front page of both the City and PWP websites, on social media, and on the online account access home page. To learn more, visit www.PWPweb.com/Defer or call (626) 744-4005.